Organisations such as the Sommeliers Association of South Africa and true pro’s in the trade like Miguel Chan, Neil Grant and Higgo Jacobs have most definitely helped to improve local wine service at some restaurants. Unfortunately the bulk of South African eateries claiming to employ a sommelier end-up sending you nothing more than an average waiter who has versed him- or herself in the difference between a Waiter’s Friend and a Tea Break, and is adamant that Nederburg Baronne is a red grape cultivar made at the Masterchef studios. 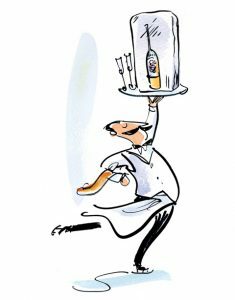 • Ask who at the table would like to see the wine-list instead of just plonking it down before the person – usually the oldest whitest male – you deem to be well-heeled, sophisticated and smart enough to select the wine for the meal. Women, especially of the liberated and wine-educated kind, deem this a huge affront and their subsequent rejection-issues can turn the rest of the evening into an ill-tasting, dismissive nightmare – for the other guests, as well as the so-called “sommelier” whose commitment to human rights and gender issues could be called into question. 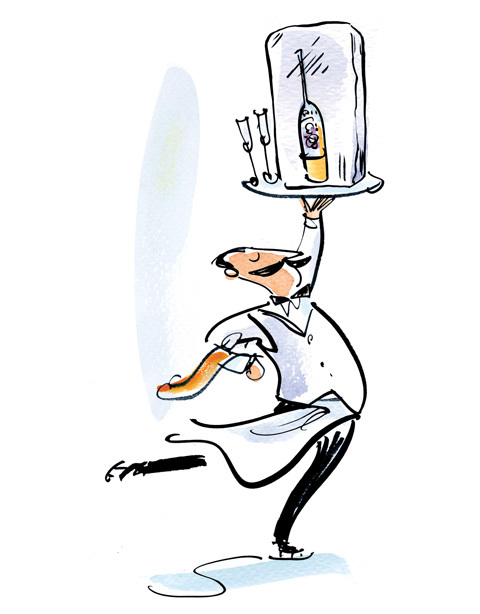 • Upon receiving a request from the table for a certain bottle of wine, “sommelier” please do not present the customer with the wine-list and ask him or her to physically point out the wine that has been ordered to you. This mostly happens when the “sommelier” does not seem to know that the wine requested is actually on the list or – more than likely – the service provider is not be able to comprehend the linguistic complexities of a reasonably lucid pronounced “Vriesenhof Pinot Noir 2011”. • Please do not overfill the wine-glass. You may think that by doing so your guests will be polishing-off that 300% marked-up bottle of Kanonkop Paul Sauer 2009 quicker than normal, leading to further orders. However, overfilled-glasses appear uncouth, implying a greedy customer and a 2/3rds filled glass is going to wreck havoc on your boss’s fine lined table-cloth once I begin swirling the wine. The latter action, by the way, is undertaken to unleash the wine’s complex aromas as well as to give the wine some air. It is not, as I have been told by a sommelier, to wet the glass from the inside. • However important your “sommelier” badge makes you think you are, I the customer am always right. Yes, I actually do want a De Wetshof Bateleur Chardonnay 2011 with my dish of sous vide lamb fillet with sage, rosemary and buttered truffles. Red meat may be consumed with white, pink or purple wine if that happens to be the way I like it. Condescendingly urging me to change my decision to red on account of the detailed and taxing wine course you did with the Two Oceans Wines brand manager, is irritatingly invasive as well as being incorrect. • If a wine is faulty, it is faulty. Sure, the customer has no right to complain and reject a wine on the grounds of it being over-wooded, green-picked or excessively tannic. But if there is TCA, VA or oxidation, accept my word and bring another bottle. It really is no use trying to tell me that “this is the winemaker’s particular style” or stating “but it is an alternatively made wine””. I am not buying – even if the wine is from the Swartland. Just send the bottle back to the wine-maker who will replace without question. • Most importantly, use your tool correctly. When opening the bottle at the table – as you should – cut the closure cap neatly instead of slashing the foil and ripping the whole thing off before attacking the thing with your cork-screw. And please guys and girls, do not grip the bottle between your legs when struggling to remove the cork. This is an unappetising beginning to the evening. If the wine steward is holding the wine bottle in his or her crotch out in the open, what the hell is going on in the kitchen?